Developed by Swing Swing Submarine and published by Neko Entertainment Tetrobot And Co. is high octane action puzzler which can be quite challenging at times, but is the game also an enjoyable romp? Continue reading our review to find out! Tetrobot And Co. makes good use of the Gamepad's touchscreen and is the first title that we've reviewed that is almost entirely reliant on the touchscreen controls and it works surprisingly well as the controls are spot-on! The game also features the all-important Off-TV Play feature as well! 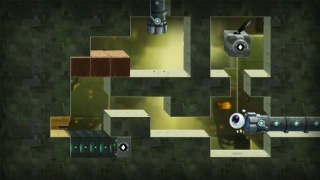 As for the gameplay itself you have to traverse through maze-like stages that are filled with traps and use your wits to disarm or work your way around the traps which can be tricky at times. You must also collect box-like blocks during the stages to unlock new worlds which is a nice feature that adds to the game's replayability! The game has quite a few stages and each stage is impressively large so expect to spend quite a few hours if you want to complete this game fully! The only negative aspect of Tetrobot And Co. is its lengthy start-up time that can take up to two minutes before you arrive at the main menu, otherwise the gameplay is superb! Visually Tetrobot And Co. looks quite nice with great level designs and nice looking special effects, while the music is decent and fits the game fairly well. It's not the game's strongest point, but it's still quite good! 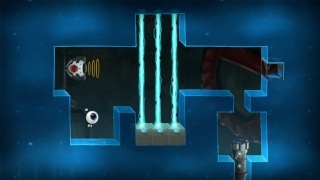 With great gameplay and excellent use of the Gamepad Tetrobot And Co. is a quality puzzler that we highly recommend, though the long loading times that occur when booting the game can be quite annoying, but regardless we still highly recommend this amazing Wii U title! Great review! This game is fantastic and I'm glad that I decided to download it. Does anyone know what the software update that was released for Tetrobot And Co. this week did?